For the summer arrival both Microsoft and Apple launched their respective new machines named. Microsoft Surface Pro 3 and Apple MacBook Air. Both have loyal users and both are equally good machines according to their respective fan base. So what the difference, to clear that out we need to see the similarities and they are very similar. To begin with they are absolutely good machines that have an excellent design that complicates the thinness of the machines.Both have equally good line of software’s installed that for their respective fans are something to ogle at for a while. If you analyse and keep the similarities aside the difference will be quiet clear between the two. Apple MacBook Air comes in two distinctive sizes 11.6 inches and 13.3 inches. While the Microsoft Surface Pro has the usual size available in the market. For the MacBook the changes over the years have not been what users were expecting. The designs have been the same and the material used has been easily deniable which was not appreciated by the users. Apple MacBook has the same wedge shape which is good to look at and feels smooth but the material which is aluminium can easily get scratched. Which is why it gets to be a big no no for the users. It cannot tag along you until you have a particular laptop bag to keep it dust and scratch proof. 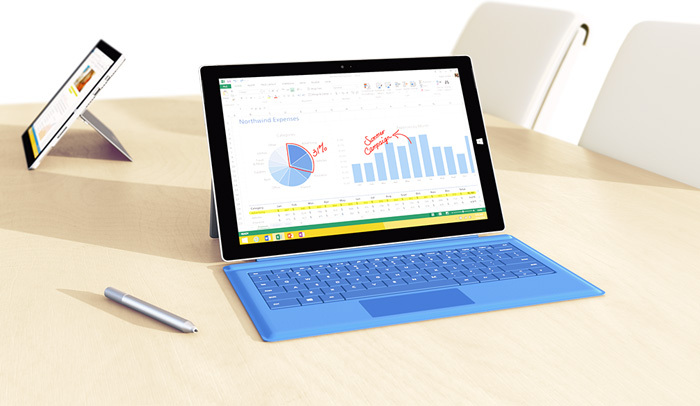 Microsoft Surface Pro 3 has both the solidness the users seeks along with the lightness and design. Now all laptop users seek some kind of a small mini pillar type things attached so the laptop stays of the table or any surface. Surface Pro 3 has a two stop kick stand that enables the laptop to cool without being heated up. Both devices have the fourth generation Intel Core I Processors with the option to choose between 4 or 8GB RAM. Battery life without a doubt goes to Surface Pro3 as it holds out much longer the MacBook. But the point when it comes to cool of goes to MacBook Air as the fan almost inaudible compared to Microsoft Surface Pro 3 which is indeed louder. Keeping in mind the above mentioned details Surface Pro 3 wins the race this time.